Today, we have a special post sent by Miss. Evelyn Golston about teaching dogs new tricks. All animals discover new things as a result of consequences. Therefore they are going to repeat behaviors which are rewarding and get away from behaviors which are not. If you'd like your dog to perform tricks for you, you should turn it into a rewarding experience for your dog. Sadly, animals don't talk our language so you have to discover a way of helping your pet recognize your demands. Â· Create a plan - How would you get the dog to try and do what you would like it to do? Â· Think about cues - How will you convey to the dog what you wish it to do? Will you use your body or voice? How would you call that trick? Dogs must be capable of seeing and hearing what you required them to do. Â· Reward your dog - Simply what does your pet like? Does it love food, toys, a pat or playing with you? Any one of these things can make an awesome reward. Food is often the easiest if you are just starting to train your dog. Â· Be patient - Some tricks take some time and entail a number of steps for your dog to learn. Â· Practice makes perfect - Brief, regular sessions can help your pet dog learn best. Â· Tools - You should have the tools necessary to teach your pet a specific trick. Get your dog clicker or any props you might need ready. Â· Inform your dog of its success - You have to discover a way of letting your pet dog realize that it has accomplished the right thing. Utilizing a word like "yes" helps your dog recognize when it has performed what's right. Â· Use tools properly - additionally, you may want to make use of a clicker that is frequently used with dolphins as well as other wild animals. You need to use the word or clicker on the exact moment once the dog does anything that you wanted it to do and promptly follow it up with a food incentive. This stuff will allow the dog to understand that it has done what you want and will be motivated to replicate the trick in the future. Â· Environment -For your dog to know a brand new behavior, it must be taught within the right surroundings. Look for a place that's calm without distractions. 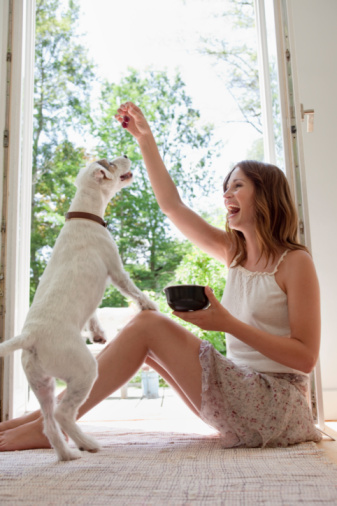 Â· Luring behaviors - Start out with simple and easy physical gestures to show the dog what you would like it to perform This is known as "luring" behavior. If the dog does what you want, tag the behavior using a "yes" then follow the behavior up with a treat. Continue doing this step 'til the dog does the trick easily. After you have done these steps but your dog seems to have difficulty in learning new things, then consider to ask the following questions. Â· Have you captured your dog's full attention? Your pet will find it difficult to learn a new trick when it is concentrating on something else. Â· Are you being reasonable? Could it be done? Have you been asking excessively? You shouldn't assume that your pet dog can master any trick in a short period of time whether simple or difficult. Start out simple and work your way up. Â· Does your dog comprehend you? Are you making yourself very clear? Your canine cannot be taught a trick if it does't fully grasp your instructions. It is quite difficult teaching your dog to do new tricks but when you have succeeded on making it perform some tricks; it would be a rewarding experience for sure. Have a super Saturday and enjoy the training. We know some tricks! Mom says we are good at them. Thank you for sharing new ideas and fun stuff with us. And thank you for all the well wishes you leave for me on my bloggy. Great information, Haopee! It's so important to really think things out before trying to teach your dog some tricks. thank you for all the love you have been sending me while I recoop from my back surgerys. Your love means so much to me. Hey, making a new tricks it is so important for young dogs, is it true that when dog will be older the tricks would be hard to realize? Also check out this article http://www.digitalistmag.com/lob/sales-marketing/social-media-matters-6-content-social-media-trend-predictions-2016-03633252 Keep up writing your awesome stuff!